Are you looking for a “starter group” to get you on the road? Or want to increase your present herd with some quality breeding females? Looking for a special future herd sire? Want some boys to protect your chickens/lambs? Or just some pet boys to keep the grass down? Whatever your budget we are sure we can help. Why not contact us to discuss your requirements or even visit to see what we have. 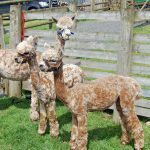 We always have alpacas for sale, its just that they are not always listed!